Today we have a great new guest blog from one of this year's worthy Queen's Award winners, Lucy Frankel of Vegware. Lucy has really brought to life the enthusiasm and pride felt by a company who have had so much to celebrate this year. April was a big month for Vegware. We’re an Edinburgh company who make compostable foodservice packaging like eco coffee cups, sandwich boxes and cutlery, all of which can be recycled together with food waste. We also help businesses recycle used Vegware together with food waste recycling through our Food Waste Network. For a 2-minute bluegrass overview of what we do, watch 'The Vegware Song'. We knew that our Queen’s Award for Enterprise in Sustainable Development was due to be announced on Sunday 21 April, and as Communications Manager I had been busy chatting to journalists in advance. Then on the Thursday just before the big announcement, we won another big award – we were named the best business in the UK by the Federation of Small Businesses, scooping the £10,000 top prize. We were thrilled but it created an odd PR difficulty – too much good news! Not only did our press release celebrate our Queen’s Award and FSB wins but we were able to announce more expansion (Vegware Australia now operating from Sydney) and the tripling in size of our Edinburgh HQ to cope with growth. We had to mark all this good news in some way. Although we have customers all over the UK and worldwide, we are a Scottish company, with our global HQ in Edinburgh. So we created our own original tartan – Vegware tartan! 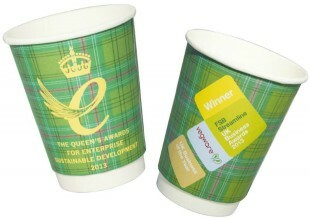 The new Vegware tartan cup bearing the Queen’s Awards logo. Our in-house designer Claudia created the design from our palette of greens, burgundy, white and pink. We needed a media-friendly image to illustrate our press release and sum up all our news. Claudia cleverly curved the tartan graphic around a photograph of a cup and added the logos of our big wins. Job done. Up it went onto Vegware’s facebook page, as part of the general excitement. But then our customers who like our page started asking when the compostable cups would be available to buy. Good question – we would need to make them first. So three weeks later, there they were in real life, no longer just a computer image. Opened new offices for @vegware - inspired firm run by inspirational folk -read what it says on their new tartan cup pic.twitter.com/ErlfaiISAL. This @vegware cup is pure compostable and recyclable, ken. Mind yersel – steamin contents may fight fer freedom! 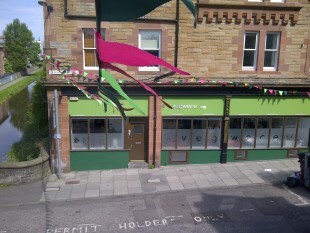 The bunting is still flying over Vegware! Our bunting is still up in Edinburgh and we are still on a high. On a roll even, as we’ve now won 9 awards this year alone, making it 28 since 2009. Thanks to everyone who has sent kind messages of congratulations, supported us in some way, or just been quietly pleased when they meet one of our compostable products at their favourite cafe.